May | 2015 | POMS AWAY! It’s easy for a young person to feel suffocated in New Zealand. I, like so many before me, couldn’t wait to get out and see the rest of the world. I spent three months travelling through eight different countries last year. Yes, it was exhausting and yes, we really needed more time in each place, but it was exactly the breath of fresh air I needed. By the end of it, I had a new appreciation for New Zealand; a new understanding of why I love it so much. New Zealand came in third on the latest Global Peace Index, after Iceland and Denmark. Also, you don’t have to worry about pickpockets, which was a relief after travelling through Europe. New Zealand came in second on the latest Corruption Perceptions Index, after Denmark. Yes, some of our politicians might occasionally get involved in something ‘dirty’, but – face it – you’re not in danger of having your family shot if you speak out against them. New Zealand has a population density of just 17 per square kilometre – compare that with the UK’s 257, or Germany’s 235. It was actually a relief to get back here after being in Europe; relaxing not to have to queue for ages everywhere, or fight through traffic. For me, Electronic Funds Transfer at Point of Sale was something I never thought about until I missed it. Most people in New Zealand use it as a matter of course; we have become a population unused to carrying cash around, which, thinking about it, is probably why we don’t tip. 5) It’s got grass verges. My family all come from the sort of working-class, Victorian-built areas of England that have narrow pavements crammed between brick houses and grey roads, with no sign of greenery to be had. That’s only romantically nostalgic up to a certain point. You may remember – or not, seeing as it was over thirteen years ago – that New Zealand’s Prime Minister, Helen Clark, was treated rather rudely by the British media for daring to wear trousers to a state dinner in honour of Queen Elizabeth II. This miffed me somewhat, even though I am British and don’t at all mind the royals. Seriously, anyone who thinks like that can f**k off. I love that New Zealanders aren’t snobs. New Zealanders live life at a peaceful pace. There are fewer “jobsworths” here. 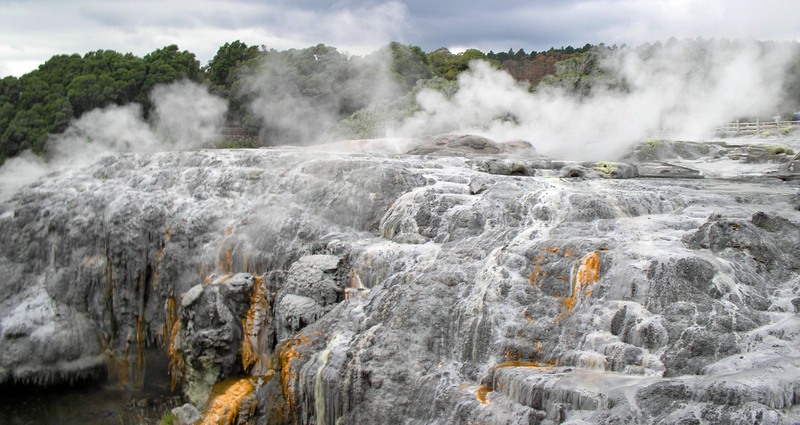 8) It’s got a temperate climate. 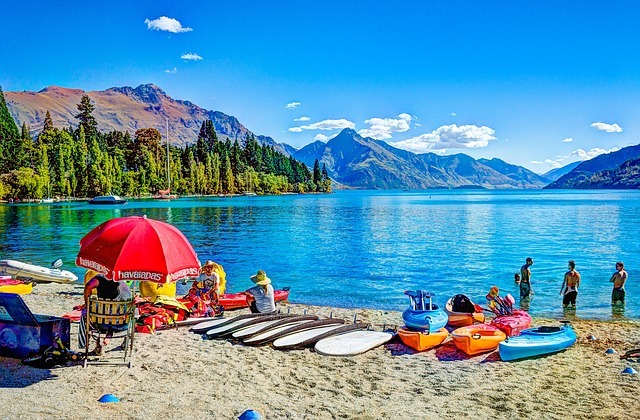 New Zealand is neither too hot nor too cold. It’s got less of the miserable, chilling sort of rain than the UK, but still enough rain to keep it green. It’s a climate that smiles on the great outdoors. 9) It’s got bloody good food. I still thought this after eating the best pizza of my life in a small family restaurant in Tivoli, near Rome. What’s so great about New Zealand’s food is it’s an absolute fusion of European, Maori and Asian cuisine, with the freshest of seafood and the finest of wine thrown in. 10) It’s got an astonishing amount – not to mention an amazing range – of incredibly beautiful scenery for such a small country. “Is it true that in New Zealand you can go skiing in the mountains and swimming at the beach in the same day?” a guy in Germany asked us. Why, I suppose it is. Hamilton may be the City of the Future, but that doesn’t stop it celebrating the past. 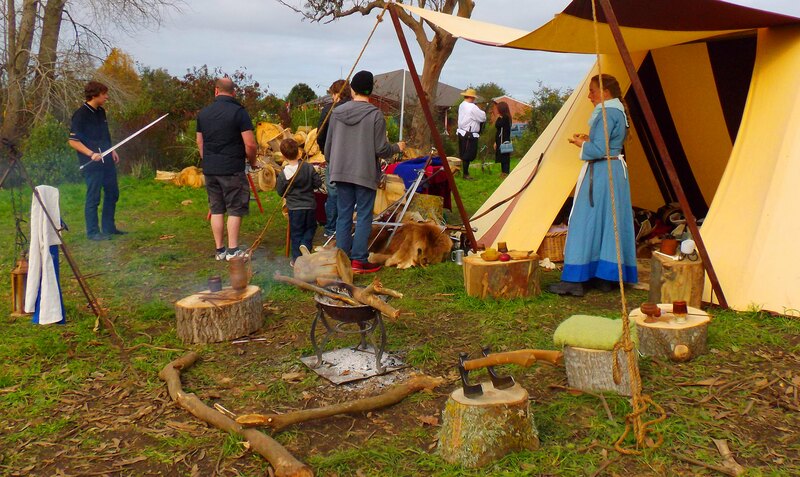 The Waikato Waldorf School’s annual Medieval Carnival is set to become a destination event, attracting people from all over New Zealand. I went to this year’s carnival and, for a school fair, it was very impressive. The banners and painted stone walls at the entrance stood as testament to how much effort had gone into the event. There were so many people in costume – and not just the kids. I was surprised at how big it was. 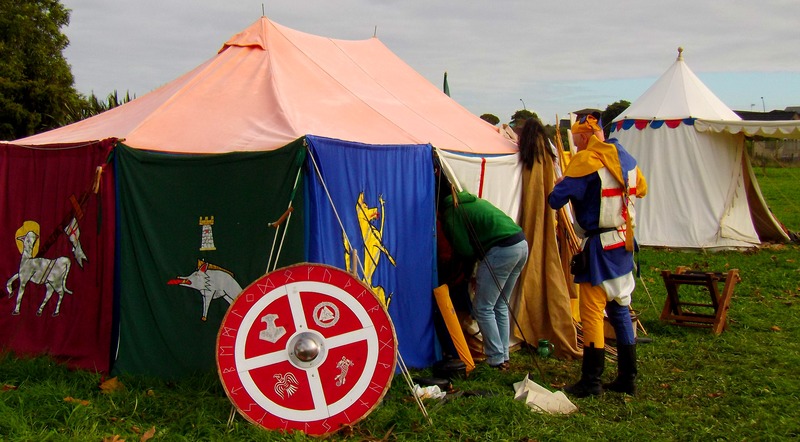 There was a craft market, wooden horse jousting, sword whittling, crystal panning, fishing, archery, a re-enactors encampment, a blacksmith’s, a combat ring and so much more – including a display of Roman soldiers (accidentally wandered in through a time portal, perhaps?) 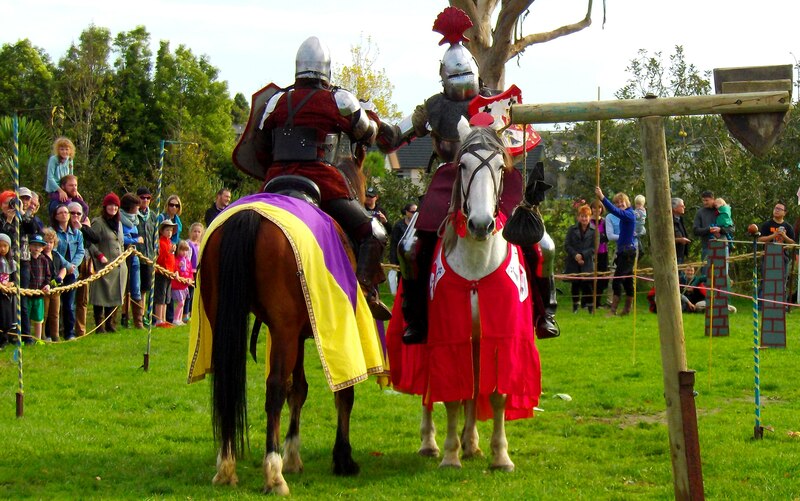 and proper jousting. 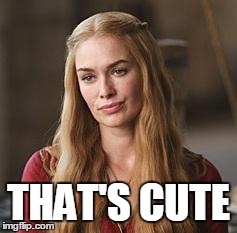 The whole thing was great fun, and it’s supposed to be even bigger and better next year. So grab your cloak, dust off your gauntlets and head to Hamilton. 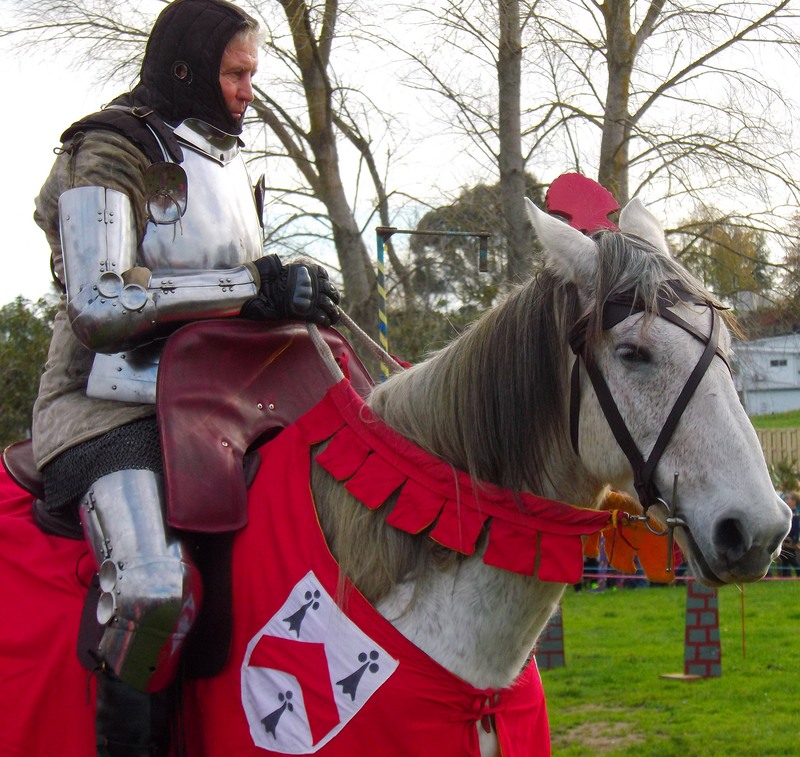 The Medieval Carnival is free to attend, but it is a school fundraiser, so don’t be stingy. The best places are the ones you find accidentally. For me, West Auckland’s Rose Hellaby House is such a place. On a quiet Sunday morning, my boyfriend and I were driving home after a party. Leaving our friends to nurse hangovers of varying severity, we had decided to take advantage of the cool sunshine and take the scenic route home. So it was that we were trundling along Scenic Drive, a winding country road with marvellous views over Auckland, when I spotted a sign next to a driveway that disappeared into the bush. Tim, who’s lived in West Auckland all his life, had never noticed the sign before. We had all day, so we turned back to investigate. The first thing we noticed upon the cresting the driveway was a garden gnome. Then, through an island of trees, there appeared a colonial-style house. Someone obviously lived there, so it seemed strange that it would be open to the public. We got out of the car and followed a mossy path up the side of the house, discovering more garden gnomes along the way. Under the shade of an enchanting tree, draped in golden ribbons of sunlight, there was a bench. Next to it was a birdbath and, next to that, a cat. It meowed at us and slunk off further around the house, as though inviting us to follow. We did so, and were confronted with somewhere that immediately made us wish we’d had a picnic with us. Behind Rose Hellaby House is a lawn on the edge of a cliff. There’s a picnic table and a lookout platform. From the lookout platform you can see the forested hills and houses of West Auckland, the volcanoes and skyscrapers of the city centre, and out to the harbour beyond. There’s a helpful sign to point out exactly what it is you’re seeing. It’s a view you can look at for a long time. 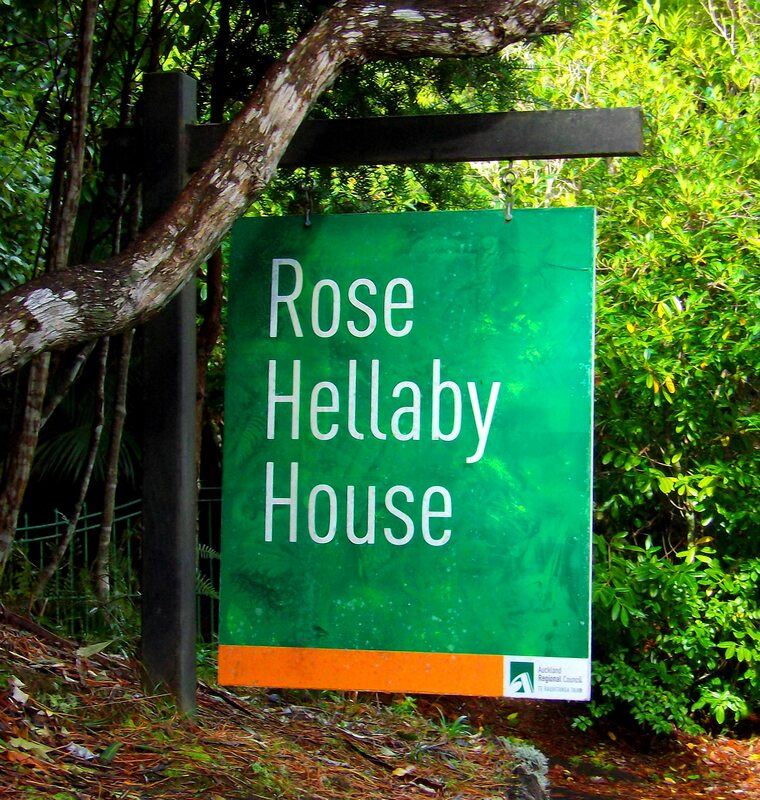 But Rose Hellaby House isn’t just a great picnic spot. Someone does live in the house, but they keep part of it as a wonderful antiques shop. This is only open on weekends and public holidays, however, so it was lucky for us that it was a Sunday. Tim and I have a thing for antiques shops. The woman running the shop was lovely to chat to, even if she did mistake us for brother and sister. She was also rather taken aback that we’d be interested in antiques in the first place, being so young. At that point, the cat we’d seen earlier came in and jumped up on a side table. I asked the lady if she was at all worried, having a cat in an antiques shop. She replied that the cat had only ever broken one vase, going after a fly in a window. How sweet. 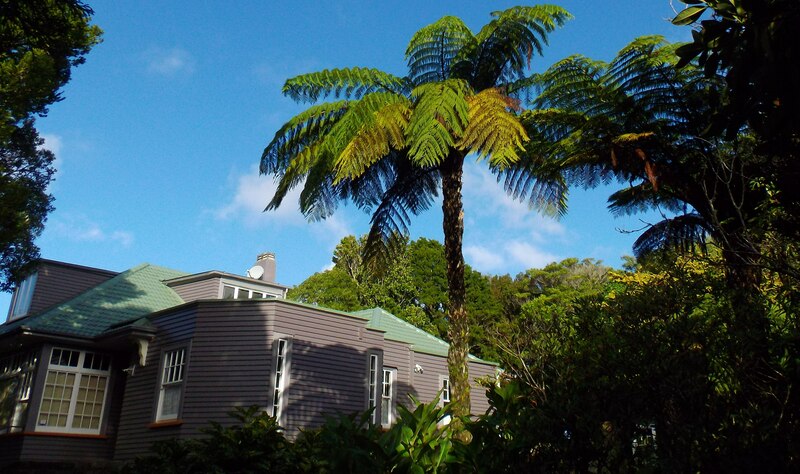 So if you’re looking for somewhere to have a picnic in the Waitakeres, Rose Hellaby House on Scenic Drive is an interesting spot. It’s a real hidden gem. Rose Hellaby herself was interesting too: an adventurous, green-fingered philanthropist with a penchant for garden gnomes. She gifted her house to the people of Auckland to enjoy the views and gardens as she had. You can see a display dedicated to her at the Arataki Visitor Centre.